Burleigh Ware is now being produced by the Burgess, Dorling & Leigh. The company was originally established as Hulme and Booth in 1851, and renamed Burgess & Leigh in 1877, after the founders Frederick Rathbone Burgess and William Leigh. Burgess & Leigh kept its family ties until 1999 when the company went into receivership. 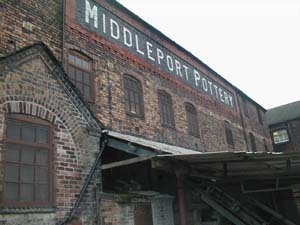 It was bought by Rosemary and William Dorling, and now manufactures under the name of Burgess, Dorling & Leigh, and is once again producing from the Middleport Pottery in Burslem, Stoke-on-Trent, which was first opened in 1889. Up until the the 1920s Burgess & Leigh produced primarily toilet wares with some tableware and before WWI the firm described itself as Toilet & General Earthenware Manufacturers. With a dramatic decline in this market the company expanded its tableware side and in the 1920s and 1930s tea and dinner services became a significant part of production. Using the brand name Burleigh Ware (a combination of Bur-gess and Leigh) introduced Art Deco tableware. The brightly decorated, hand-painted and enamelled designs were a great success. The company introduced new shapes including Zenith and Imperial, both modelled by Ernest Bailey, with the majority of patterns designed by art director Harold Bennett. Charlotte Rhead worked for Burgess & Leigh from 1926-1931, and designed under the firm’s trade name of Burleigh using shapes already in production but decorating others with her own special designs. Along with the Art Deco tableware, the company gained a reputation for their novelty ware, especially their relief-moulded jugs with sculptural handles in the form of animals, birds and figures. Still fetching premiums today are the 1930s Ernest Bailey sporting jugs, most notably the Cricketer and Golfer. The company moved to ‘utility’ ware during WWII, as decorated ware in the home market was banned. 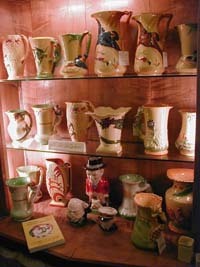 This continued a few years after the war and it was not until the 1950s that the company began making decorated ware one again. A large proportion of this production went overseas. During the 1950s the earlier brightly decorated, hand-painted and enamelled designs of the 1920s and 1930s were no longer popular and were too costly to produce. Burgess & Leigh began producing more modern patterns using lithographic or screen printed transfers. Notable patterns of the time include Fantasia (plate pictured above left). Contemporary designs continued into the sixties. In recent times, there has been a revival of interest in traditional underglaze printed patterns such as Burleigh Willow and Calico, reproduced from Burgess & Leigh’s own nineteenth century engravings, as well as interest in the famous Burleigh Ware jugs.